Product prices and availability are accurate as of 2019-04-04 03:17:49 EDT and are subject to change. Any price and availability information displayed on http://www.amazon.com/ at the time of purchase will apply to the purchase of this product. 3M Heat Shrink Ring Electrical Connectors, Yellow, (12-10 gauge). 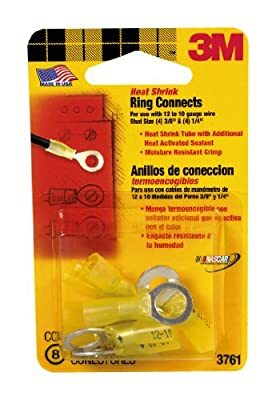 The 3M Yellow Heat Shrink Ring Connectors provide the safest and most reliable connection because they cannot be removed unless the mounting screw is also removed. The heat shrink tube also features an additional heat activated sealant and moisture resistant crimp for added protection.